Your end-of-year School Fun Fair is a hit with parents and students. Enjoy these exciting carnival-themed school events and activities ideas using the hottest trending party rentals for 2019. From fun food machines and classic carnival games to cutting-edge inflatables, get ready to plan the event of a lifetime! Whether you’re selling event passes at a ticket kiosk, or you’re setting up a food station for pizza or hot dogs, it’s important to set up designated stations! Rent our classic red and white carnival tent or utility cart to set the atmosphere for your big event! Rent an assortment of inflatables for your end of school fun fair. Enjoy classic bounce houses, cutting-edge obstacle courses, or double-lane slides. Introduce a friendly game of sports with our Ultimate Sports Arena or 3-in-1 Sports Inflatable. 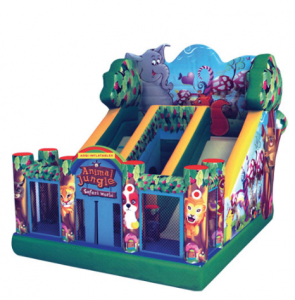 If you’re looking to amuse the younger children, our inflatable play centres come in a variety of themes and levels of difficulty. Capture this exciting event forever with an interactive photo booth. Discover a wide array of options like our Green Screen Photo Booth or Retro Black Photo booths! Choose from our wide selection of photo booth props and photo booth backdrops. From classical carnival games like ring toss or tip-a-troll to giant skill games like giant connect 4 or giant Jenga, students, parents, and teachers will love the gaming component of the event! Carnival Games or interactive games like money machines are a great way to give away prizes! Getting hungry from all the games? All the fun and games are sure to make you hungry! Popcorn and cotton candy carts are a fun and interactive way to incorporate food into the event. Rent a large red and white carnival tent to provide additional shade and that special carnival flair. Contact our experienced party planners about your end of school event. We would love to hear from you!